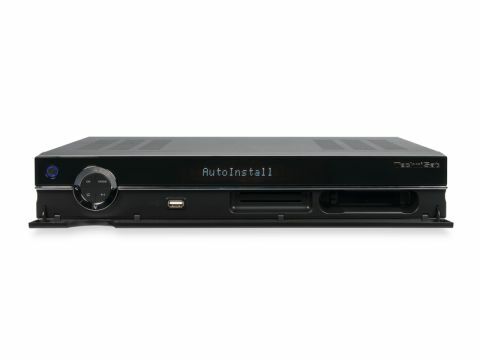 This is a fairly expensive PVR, and this is reflected in the many worthwhile features – notably the network and EPG-related ones – that are included and overall. But the lack of two DVB-S2 tuners is a disappointment that cannot be overlooked. In addition, the eccentricities of the user interface, notably those related to channel management, need addressing in a firmware update. But in many respects, this is a likeable receiver – once you learn to live with its foibles. An HD revamp of the twin-DVB-S2-tunered Digicorder S2, the HD-S2x has already been available (as the HD-S2) for some time in Germany. Unfortunately, the HDD is the same 160GB as the S2's. Given the greediness of HD recordings, we would have expected bigger. That said, a 500GB version is available for extra outlay. One cannot fault the contemporary and surprisingly compact styling of the S2x, which wouldn't look amiss next to – say – a Loewe TV. Function follows form with a control disc that facilitates basic timeshifting, soundtrack/subtitle and last-channel selection, as well as the usual channel-change, volume and standby. They're augmented by a multi-function fluorescent display that, among other things, lists the name of the currently selected channel. The lower half of the front panel swings downwards to reveal the USB port, card readers for built-in Conax CAM and CI slots. You can swap the supplied hard disc for your own 3.5in SATA drives too. The new model adds Ethernet capabilities, which enable the timer to be remotely scheduled via the internet, and recordings to be transferred to a PC. Multimedia files can fly the other way, thereby allowing you to make the most of the onboard media player (or you can transfer via the USB port). Also on the rear panel (above) are the two LNB inputs that are configured in the setup menus, and support the SatCR and DisiCon type of single cable router LNB to feed both tuners. Unfortunately, there's no UHF modulator or aerial connectivity. The component and HDMI will go from 576i to 1080i, and if you have a DVD recorder the RGB Scart output can be active at the same time as the HD outputs. The S2x is ready for motorised dishes, courtesy of DiSEqC 1.2/USALS. Initial setup – the parameters of which include language, location, display format or whether you're using one or both LNB inputs – is conducted by a wizard. The options here are comprehensive – the LNBs that can be connected include single LO, C-band, and single cable routing (SatCR and DisiCon). Unfortunately, you can't have two dishes aimed at different satellites, unless they're fitted with twin (or quattro) LNBs – and under those circumstances you'll need DiSEqC switchboxes to make sure the inputs are always from the same satellite. The most flexible solution is to use a DiSEqC motorised dish with a twin LNB – our review configuration. The procedure to get this receiver to work with a DiSEqC rotor is quite unusual: you have to choose 'motorised' from the list of available satellites, then work your way through the satellites and enable the ones you can receive. Instead of using a manual 'step' mode to set the precise sat positions, the excellent 'auto-focus' system peaks the dish for maximum signal strength. It's then a matter of searching the satellites, either individually or with a global search that automatically visits each in turn; sensibly, this allows for transit times between satellite positions. In 'auto' search mode, you can choose all services, or just the free-to-air ones. Also provided are transponder and manual searches, with PIDs for individual channels if desired. You can also specify modulation type, though some reason you can choose FEC for DVB-S2, but not DVB-S. Most obviously missing is a blind search option for adding new transponders without downloading a new database. Pressing 'enter' accesses the channel navigator, and by default, the 'master list' of channels is displayed. Press the 'options' button, and you can access the 'all channels' list – a disappointing maximum of 6,000 – or sort channels according to provider. For more advanced sorting you have to select the main menu's 'TV (radio) lists organising' option. From here, you can copy or remove channels from the all-channels list to the master list. The 'all channels' sorting functions include alphabetical order, free, new, HDTV, satellite and even language – but there's no ability to find a channel by progressively entering more of its name. Another annoying characteristic of this receiver comes to the fore if you're using a motorised dish. When working through the all-channels list, the dish insists on moving to the currently highlighted one – a great way of wearing out your motor prematurely! You have the six favourites lists (three TV, three radio), but we could find no reference to these anywhere in the menus. We had to wade through the manual to discover that favourites lists have to be turned on manually (this is a setup option). From then on, favourites can be defined by switching from the relevant master lists (i.e. radio or TV) to one of the three favourites. This is daft – we would have thought that anyone wanting to remain sane would be using favourites by default. Disappointingly, you can't define favourite channels directly from the navigator. Rather than one button press, once they're switched on, favourites are available as a channel navigator 'option'. A more sensible system would be welcomed. The EPG, which can program the timer directly, supports now-and-next and 7-day schedules. A neat feature is the 'SFI' button, which accesses an EPG now-and-next 'digest', complete with time-remaining bargraphs and the ability to proceed further through the schedules if available. This is tied in with Technisat's EPGPlus, an unusual system that involves downloading data from an unspecified transponder at 0.8°W. Regrettably, the number of channels covered here is small and primarily Scandinavian, although a 'journal' function allows you to update user-defined channels from conventional DVB EPG. None of the UK's terrestrial channels is covered by the download, which is disappointing, given that on FTA (as opposed to Freesat) these broadcasters only offer now-and-next DVB EPG data. Downloaded channels benefit from a 'genre' display mode for upcoming programmes, but this is denied to non-EPGplus channels that offer seven-day EPGs, such as the German ones. Odd, given the receiver's origins. Other features include a picture zoom, teletext, subtitles and a useful channel technical information display, including bitrate and resolution. You'll also find a PiP function for insetting the picture of one channel into another. Only one of these can be an HD channel, which brings us to a severe limitation of the HD S2x. Only one of the tuners is DVB-S2-compliant, which means that you can't view one HD channel while recording another (a twin-tuner model, the HD S2 Plus is forthcoming). Lack of dual-HD recording aside, the PVR functions rank very highly. An oddity to watch out for is that if the unit is in PVR mode, attempting to enter the menus will ask you if you want to stop recording. If you want to manually set or change the timer you'll have an interrupted recording. However, you can still access the channel list and EPG – and play existing recordings, which are listed with a press of the green handset button. You can pause the current channel, kicking off the process of using the HDD as a buffer. You can then review, cue, jog/shuttle and play to your heart's content. A welcome touch is that you can preserve the contents of the buffer as a recording should you decide it's worth keeping. Up to 999 recordings, initiated manually or using the 30-event/1-year timer, can be stored on the HDD. There's also an editing function for trimming off excess material, or copying a segment to a new file. You can also use the Mediaport software (from Technisat's website) to transfer recordings (which are in standard transport-stream format) to a PC across the network, or from a PC to the S2x. MP3, JPEG and DVD-type VOB (MPEG-2) files are the only formats with which the HD-S2x is compatible; DivX and WMV aren't supported. Networking also lets you access the receiver from any suitable internet-enabled device in the world, although for now this only extends to timer scheduling. The HD-S2x may be fast at selecting channels – within a couple of seconds if it's on the current satellite – but searches are ponderous: an all-channels DVB-S/S2 search of Hot Bird clocked in at over 11 minutes. ITV HD is not receivable with the S2x, but reception of channels from a variety of different satellites proved reliable – even in damp weather. The tuners are obviously up to scratch in sensitivity terms. In AV quality terms the HD-S2x also puts up a good showing. Pictures from Arte HD and BBC HD are sublime, intricate detail and impressive colour fidelity being only too apparent on the Full-HD Cineversum Paris projector we were fortunate to have in for testing at the same as well as our 32in Sony Bravia LCD. Poor-quality SD channels (not Technisat's fault) remain just that. From MP3 files and digital TV alike, sound quality from both the analogue and digital outputs cannot be faulted. A final point to note is the relatively low power consumption.